What's going on in Egypt's Al-Azhar University? The death toll of clashes between police and supporters of the Muslim Brotherhood has risen to 11 people across Egypt, sources from Egypt's health ministry told Ahram Online. The cities where protesters died included Cairo, the Suez Canal city of Ismailia, Alexandria, and Fayoum, the source said. The Brotherhood-led National Coalition to Support Legitimacy, which called for Friday's protests, released a statement earlier on Friday evening claiming that 19 protesters were killed by police. Scores of others were injured as supporters of the Islamist movement continued to protest against the transitional authorities, who labelled the group a terrorist organisation last month. Clashes erupted in Nasr City on Friday afternoon. Protesters threw rocks and fireworks at police and set tyres on fire. 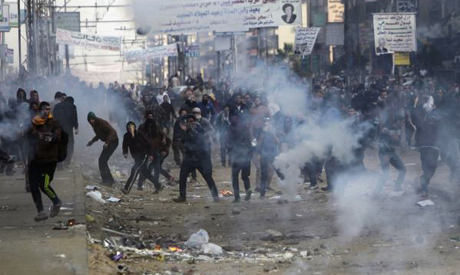 Security forces fired teargas to scatter the crowds, Al-Ahram Arabic website reported. A public bus was smashed and several cars were shattered in the violence. Police fired teargas at a student march at the nearby Al-Azhar University, a major scene of Islamist protest in recent weeks, state news agency MENA said. Brotherhood supporters set the Faculty of Agriculture building at Al-Azhar University on fire and damaged five administrative offices inside, Al-Ahram reported. Police also fired teargas on Friday afternoon when some 300 pro-Brotherhood protesters blocked off Cairo's corniche road near the High Administrative Court in the southern suburb of Maadi. Protesters responded with stone-throwing. Eyewitnesses told Al-Ahram on Friday morning that protesters in the Giza's Faysal district had thrown Molotov cocktails at an armoured police vehicle, setting it on fire, and shot at police officers trying to escape from the car. Violence also flared in Egypt's second city of Alexandria when hundreds of Islamists clashed with civilian opponents, using stones and birdshot. Security forces stepped in to scatter the crowds, arresting several pro-Brotherhood protesters in possession of "rioting tools" and leaflets against the police and army. The National Alliance to Support Legitimacy had called for Friday demos in the run-up to their planned boycott of the upcoming constitutional referendum. Supporters of the Muslim Brotherhood and the group's ousted president Mohamed Morsi reject the new constitution, which was amended after Morsi's ouster. Recent months have seen regular clashes between protesters and security forces during weekly Friday protests. Egypt's authorities declared the Brotherhood a terrorist organisation in December, accusing the group of links with recent attacks on state institutions and on churches since Morsi's ouster. Interior ministry officials have warned that anyone taking part in pro-Brotherhood protests after its designation as a terrorist organisation will be punished with five years in jail, while protest leaders might face the death penalty. Egypt's interior ministry said in a statement on Friday afternoon it had arrested 120 Brotherhood members nationwide, and said they were armed with explosives, Molotov coctails, firearms and knives. Let me guess the brotherhood sheep will tell us. They will tell us it was peaceful, they will tell us they are not involved in violence. Then start pointing their finger every which way but themselves. As long as the Egyptian army, police, and the majority of Egyptians keep the brotherhood barberians in check and convict them of the crimes they commit you all will be fine. It's clear that the brothers have choosen the path of violence. They clearly know that Morsi won't come back again, after 6 months, but they have chosen to continue protesting. So far it hasn't brought anything to them, any result at all, just increasing the hate the population has for them. Their protest has become a goal in itself, protesting for the sake of protesting. It follows that they protest now to harass the state and tell the world that they exist. They want to terrorize the Egyptians with their protests, vandalizing the public and private property. But as we deal with the cokroaches, we will deal with them, either we crush or we just ignore them. I feel sorry for the sheeps who live in a lalaland and go to protests.